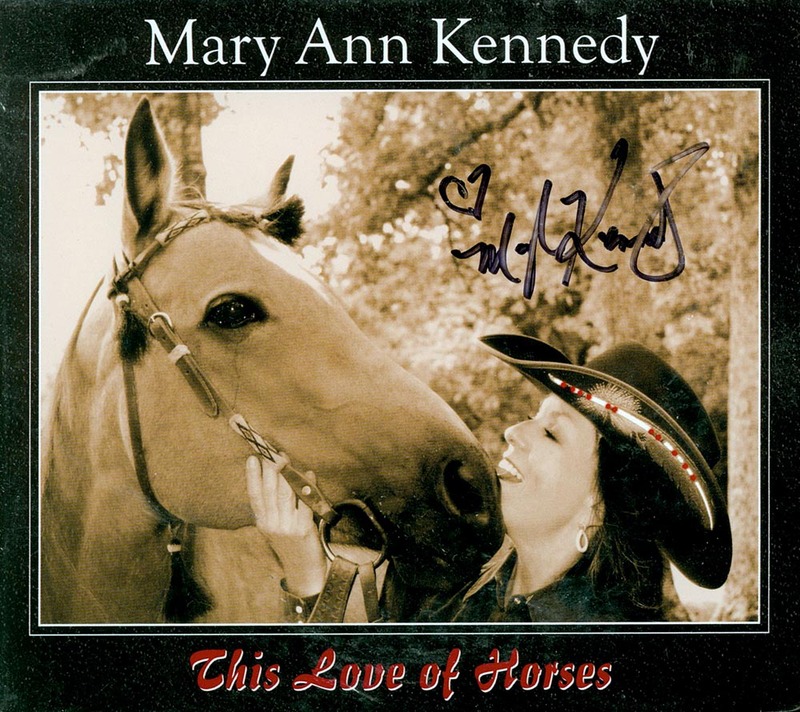 This Love of Horses CD by Mary Ann Kennedy HAND SIGNED BY MARY ANN WHILE SUPPLIES LAST! HAND SIGNED BY MARY ANN WHILE SUPPLIES LAST! Hit songwriter Mary Ann Kennedy writes and performs songs from the heart about horses and the animals we love. This is indeed our music! Mary Ann's music will feel familiar and comfortable to you. Her extensive background in the music industry has yielded songs that are very well produced, rich with clarity and detail. No stranger to the music scene, Mary Ann has written numerous popular hits; "Ring on Her Finger, Time on Her Hands" -performed by Reba McEntire and "I'll Still Be Loving You" -performed by Restless Heart were both nominated for Grammy Awards. You will have also heard Mary Ann singing backgrounds and playing mandolin on many Nashville records. She has recorded with Martina McBride, Faith Hill, LeAnn Rimes, Art Garfunkel, Reba McEntire, Diamond Rio, Pam Tillis, Hank Williams Jr., John Berry, Kathy Mattea, Emmylou Harris, Blackhawk, Maura O'Connell, Ashley Cleveland, Mindy McCready, Anita Cochran and Caroline Dawn Johnson, to name some. "I have 2 passions in my life. The love of horses and animals, and the love of music. "The Trail Less Traveled" and the newly released "Hoofbeats, Heartbeats & Wings" embraces them both. My two soul animals: my dear pug, Choy, and the colt I raised, Tonka, shared a birthday on May 16th. Choy was 15 years old and Tonka was 9 when their souls flew away together in August of 2000. Through my deep grief, little did I know that they would inspire a whole new chapter in my life. I began writing songs about them and other animal loves of my life. Death and rebirth, the circle of life....it is amazing and I continue to be grateful. They are now my angels, they're 'not really gone'. My hope is that hearing this music will inspire healing, joy and celebration of life." Rhythm of the Ride CD by Mary Ann Kennedy HAND SIGNED BY MARY ANN WHILE SUPPLIES LAST! Trail Less Traveled CD by Mary Ann Kennedy HAND SIGNED BY MARY ANN WHILE SUPPLIES LAST!